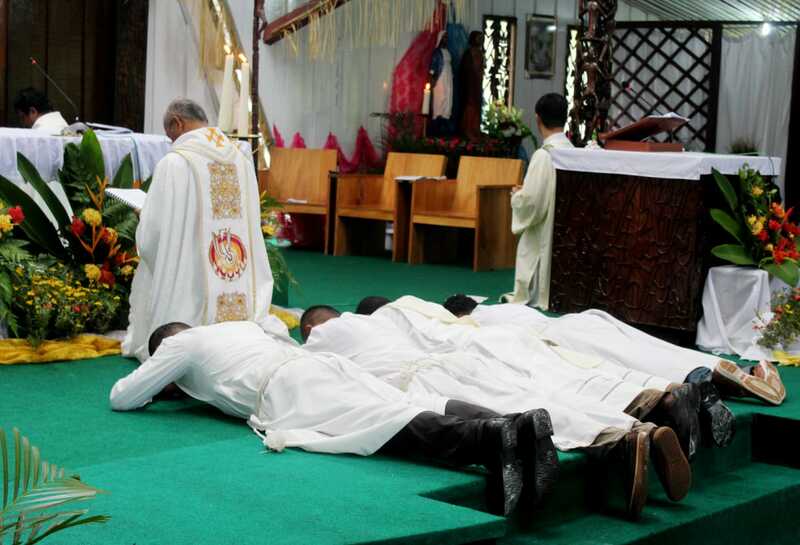 The local bishop, Mgr Aloysius Murwito, also ordained three deacons. Religious vocations in the diocese are rare because of the lack of a minor seminary and ethnic Asmat’s nomadic lifestyle. Last year, more than 70 children died from measles and malnutrition-related diseases in the area. 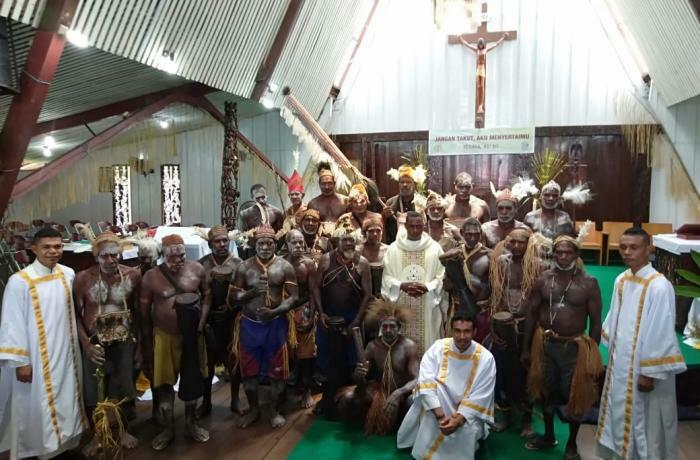 Jakarta (AsiaNews) – Fr Moses Amiset is the first ethnic Asmat to be ordained priest. 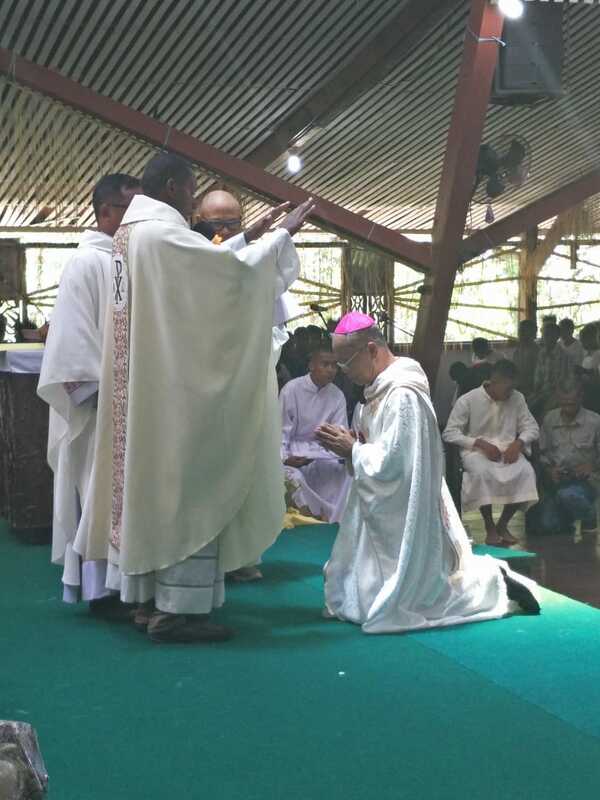 This is a source of joy for the entire Catholic Church in Indonesia, but above all for the Diocese of Agats, in Papua, Indonesia’s easternmost province whose population is predominantly Christian. The ceremony took place on 2 February at Holy Cross Cathedral in Agats. 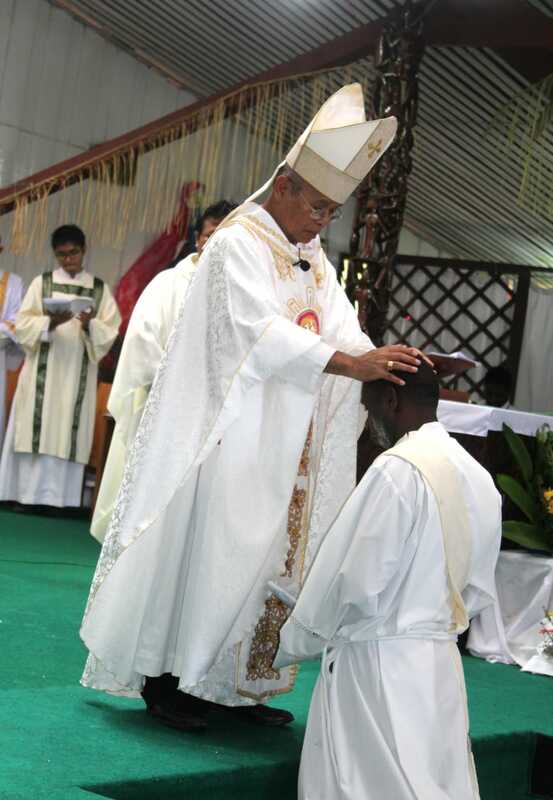 The local bishop, Mgr Aloysius Murwito, also ordained three deacons during the service: Br Laurensius A. Kupea, Br Innocentius Nurmalay and Br Yohanis Laritembun. 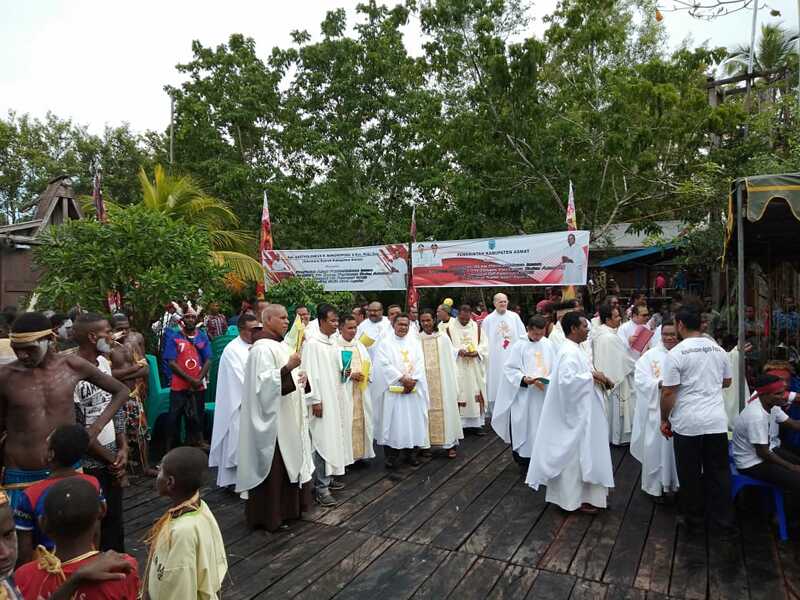 Religious vocations are rare in the diocese, Papua’s poorest and remotest area, for a number of reasons, starting with, unlike other ecclesiastic provinces, the lack of a minor seminary. 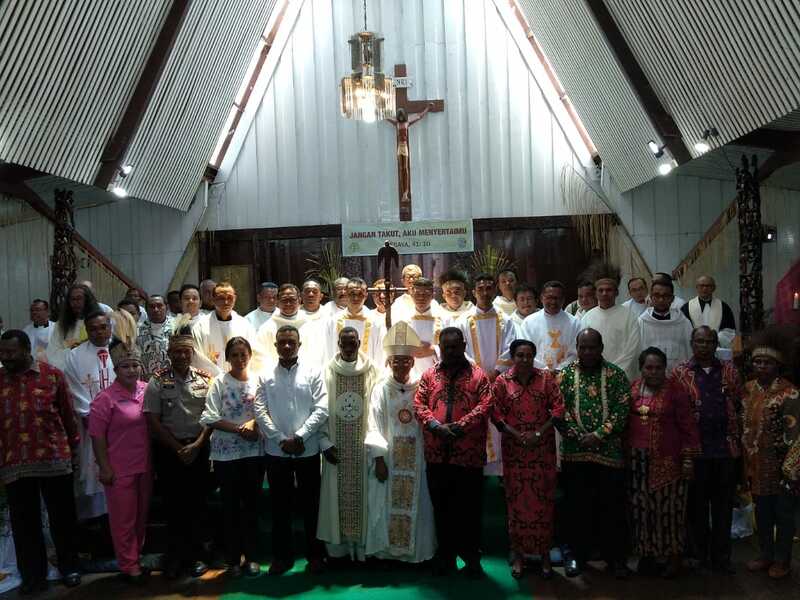 Most seminarians who eventually come to the diocese are born into local families who moved to the Maluku (Moluccas) and Flores islands, Indonesia’s two "Catholic” territories. For ethnic Asmat, the religious vocation is made that much harder by their nomadic lifestyle. Fr Bobby Harimapen, parish priest at Agats’s cathedral, told AsiaNews that Mgr Murwito assigned Fr Moses to Kamur parish. Born in 1982 in Pau, Asmat Regency, the future priest later moved to Tual (in the South-Eastern Moluccas) to attend high school. Between 2005 and 2006, he completed his preparatory year for the religious life in Sorong, the largest city in West Papua province. 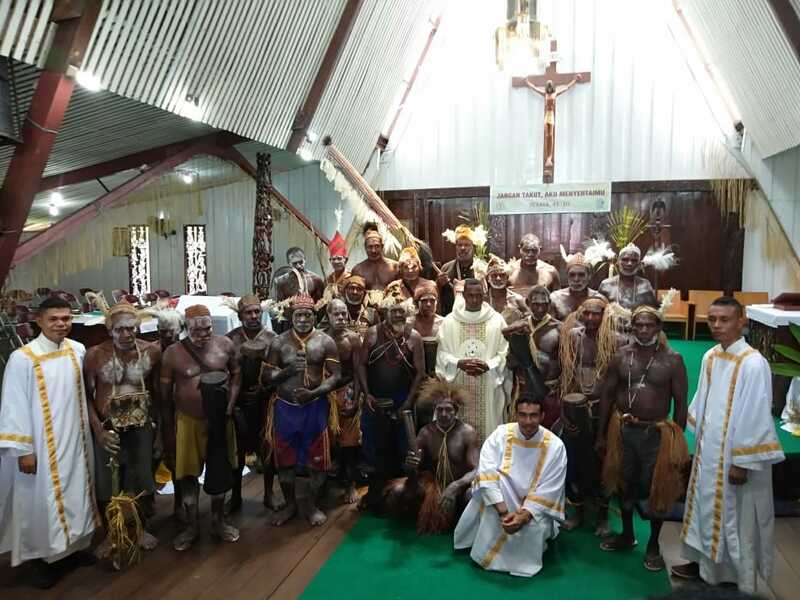 Fr Moses went to study Philosophy and Theology at Jayapura, the capital of Papua, before performing pastoral work in Bayun parish, between 2013 and 2014. He was ordained deacon in 2017 in Atsj parish. The Diocese of Agats covers a very isolated territory, with unique characteristics, found nowhere else in the huge country. Last year, the region was hit by a severe humanitarian crisis, with more than 70 children dying from measles and malnutrition-related diseases. The local Catholic Church was among the first institutions to help the local indigenous population. Mgr Murwito coordinated two teams of volunteers who hand ed out aid in several villages of the hard-to-get-to territory. Moving around in the area is very dangerous physically and expensive. In 2013, AsiaNews 's reporter accompanied the Bishop of Agats on a trip to its most distant settlements on a pastoral mission. Humanitarian emergency in Asmat district (Papua) "under control"